I have good news, mine JAX-RS Kryo support has been moved to Jersey incubator. Original GitHub repository has been updated to use Jersey module. And as a bonus I've added two ways how to try it. In this blog post I'm going to return to one of my previous post about JAX-RS Message Body Providers using Kryo serialization framework. Today I'll show you performance statistics and compare it with some of Jersey build-in providers. JAXB RI providers to read from and write to XML format. Jackson providers to read from and write to JSON format. Just plain text provider to read and write String only. It uses Jersey build-in provider. Each test application was executed using Grizzly HTTP Server, no servlet container, on 4 core VM. And load has been produced from another 2 client VMs using wrk - a HTTP benchmarking tool. 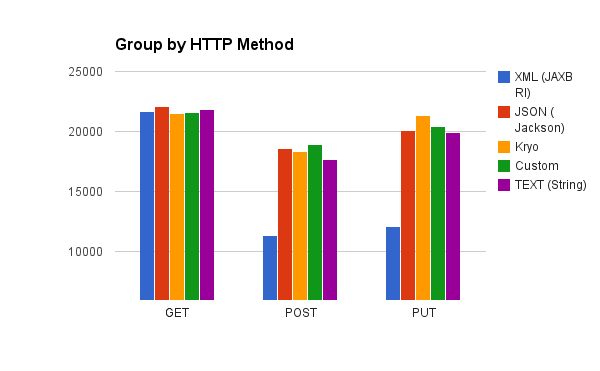 GET, POST and PUT HTTP methods was measured. It is necessary to say each test works just with one instance of Person entity. It means data load is small. Test's focus is on throughput measurement. Please note the Kryo provider is not in production quality. It just demonstrates how simple it is to enhance JAX-RS runtime to support new entity media type. 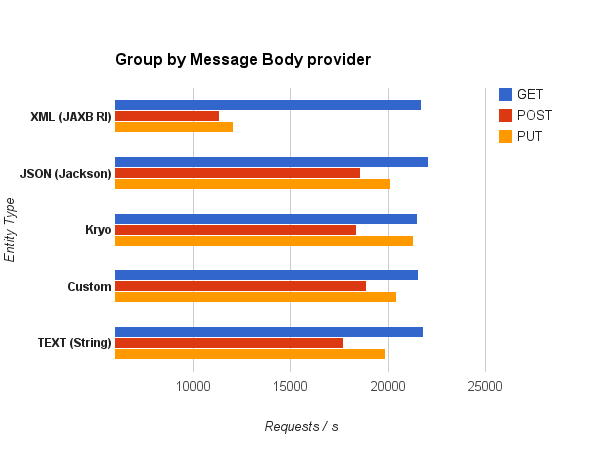 However it is naive implementation of message body provider it provides very good performance. Kryo also support class registration and compression features that can also affect performance.